With the scorching summers about to knock your door in a span of few weeks, are you on a quest for the best brand of AC? LG could be your go-to-brand in that battle against the soaring temperature. Lucky Goldstar or LG—a name through which it is better known, is trusted for its quality, innovation, and service by the experts and consumers alike. They are known to launch ACs aptly matching the customer requirement in terms of design, tonnage, cooling capacity, condenser, compressor and more. LG’s ACs deliver the comfort cooling by adjusting the temperature according to the body metabolism. LG, Voltas, Bluestar, Daikin, and Samsung are prominent AC brands by sales in India, controlling roughly two-thirds of the air conditioning market. While other foreign brands mostly rely on the imports, LG has established two manufacturing units, one in Pune and the other one in Noida. LG happens to be OEM (original equipment manufacturer) for many AC components including the compressor. This gives LG the import duty advantage. LG was one of the first brands to offer inverter AC in India and from 2018 onwards, all the split ACs offered by LG would be inverter-based. We will learn more about the inverter technology offered by LG in this article. In the residential segment, LG offers both types of refrigerators—split and window. As we said earlier, summer is on the way. Every Indian summer brings along the pack of heat forcing you to look for a refuge. Imagine yourself in a nice hill station, cool breeze flowing from the Himalayas. Well, it does feel so soothing, eh? Now with your routine work, how long would you be able to stay there, escaping the sweltering heat. Himalaya Cool technology from LG tries to replicate this Himalayan feel so that you can get the ambience of hill station in the comfort of your home. There is a dedicated button to enable this mode labelled as HCOOL on the remote. When enabled, AC would throw cool air at a super-high speed for around 30 minutes, till the temperature of the room is brought down to a comfortably cool level. 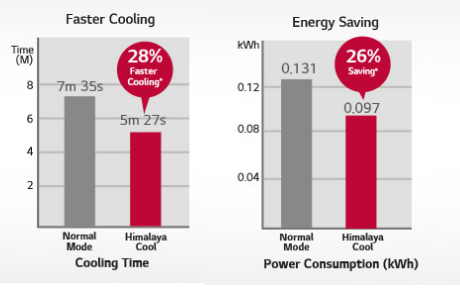 With the Himalaya Cool technology, LG ACs deliver faster cooling without compromising on the energy saving aspect. Certain models of LG use a similar mode called JetCool, whose functioning is almost same as Himalaya Cool. Summer season makes the AC overwork and with the monsoon to follow, ordinary ACs could fail to control the humidity or even result in water leakage. During the rainy season, conventional air conditioners not only consume more energy but also make the room uncomfortably cold which may lead to health ailment like sneezing, common cold or even headache. LG being an experienced brand have noted this problem specific to the subcontinent’s climate. As a solution to it, new models of LG ACs come with Monsoon Comfort technology. On enabling the Monsoon Comfort option, the refrigerant cycle is expedited to rapidly extract humidity from the room. Generally increasing the frequency of refrigerant cycle would lead to an increase in power consumption, but LG has optimized this technology to keep power consumption minimal. The Monsoon Comfort technology provides the balanced cooling amidst the soaring humidity during the rainy season. Whenever you hear a word AC, what comes to the mind is an appliance which blows chilled air bringing down the temperature of the enclosed space to comfortably cool levels. But the pioneers of air conditioning systems invented it with an idea of “conditioning” or setting it to a desired/specific temperature. So theoretically ACs should condition the temperature in the winter too as per the user’s need i.e it should heat the room during the frosty winters. Well, modern premium split ACs are capable of implementing that theory (of heating during winters) too. They come with a built-in heater functionality in the form of heat mode option, which when enabled would reverse the air conditioning process. This results in circulation of hot air inside the room. The best part is that it does not use a heating element like conventional heaters. This means they are not much more energy efficient than the dedicated heaters but also eliminates the risk of low oxygen—a typical problem with the ordinary heaters. Usually, ACs come with 2-way (up and down) swing blade to disseminate cool air inside the room. But modern premium LG ACs comes with the 4 Directional (4D) air swing function (up-down + right-left) which blows the cool air in multiple directions to ensure thorough cooling inside the room. The main advantage with 4-way swing ACs is the ability to spread the air flow across the room without the mandatory need of manual adjustment from the user. Modern split ACs from LG comes with larger fan and body which increases the airﬂow and spread it up to 30 feet. As a result, every corner of the room is nearly as cool as the area in front of the AC blade. Modern LG ACs protect users from the scourge of this harmful particulate and other microscopic organisms. Also, these filters are easy to clean. Are you someone who is frequently pestered by mosquito bites even in running AC? Well, then LG ACs can be your saviour. In fact, LG is India’s first brand to come with anti-mosquito technology. There is a dedicated button for enabling Mosquito Away mode even when the AC is off. 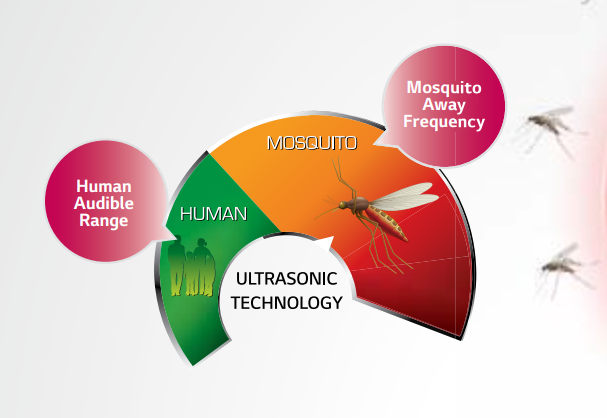 When enabled, a specific range of ultrasonic frequency waves emitted which mosquitoes can’t stand. These waves are inaudible to human ears and completely safe too. Thus, without using any harmful chemicals modern LG ACs make mosquitoes recede from your room. The heat exchanger of an ordinary AC is composed of uncoated aluminium which tends to get corroded over time. This, in turn, would greatly reduce the cooling capacity of the AC which would then mean that it would barely able to cool during the peak summers. But the new LG ACs come with a Gold Fin technology to prevent the heat exchanger from corrosion by covering it with a layer of anti-corrosion material. Another good thing is they come with an auto-clean functionality. This means that the interior of the air conditioner is cleansed by drying the heat exchanger. Nano ions from the Ionizer sterilize the heat exchanger to restrict the growth of mold and bacteria. Modern models of Inverter V series come with a multi-flow condenser which comprises of multiple channels with a slim design for the passage of coolant through it. This results in faster cooling in an efficient manner. The design reduces the air pressure drop and radiator heat load due to super-thin profile. The fine new range of ACs from LG is powered by the revolutionary DualCool technology. With an increased operating frequency range, this dual inverter compressor technology gives LG an upper hand over its competitors in terms of cooling efficiency. So, what is an inverter technology? Well, to be really simple, inverter technology is analogous to the car accelerator. When a compressor needs more power, it gives it more power. When it needs less power, it gives less power. With this technology, the compressor is always on but draws less power or more power depending on the temperature of the incoming air and the level set in the thermostat. Compared to the conventional inverter, dual inverter-based AC comes with an advanced BLDC motor with a wider range of frequency helping it to maintain the desired temperature with minimal fluctuations. Dual inverter ACs uses variable tonnage technology. So ACs with DualCool technology coming with 1.5-ton capacity can vary the tonnage from as low 0.26 ton to as high as 1.71 ton according to the ambient conditions and the user requirement. LG ACs in a true sense provides “air conditioning” all year round. Be it cooling during scorching summers, dehumidifying during heavy downpours or heating during bone-chilling winters, LG would be your reliable companion across weathers. On the aesthetic front, floral pattern design of few LG models gives it a refreshed look. New premium model’s remote comes with a night glow buttons allowing the user to have easy access to the settings. The 4-way cooling with 30 feet airflow range ensures cooling reaches every corner of the room. LG ACs are designed to protect users from pollutant, bacteria, and mosquitoes apart from delivering comfortable cooling in an efficient manner. DualCool inverter with a wide operating range is the major plus point in favour of LG. LG has received critical reviews for its past models coming with an aluminium condenser. An aluminium condenser is cheaper than the copper condenser but tends to get corroded faster. Also, it’s very difficult to repair an aluminium condenser and it mostly needs a complete replacement; which means the repair charges would be pretty high. But lately, LG has added anti-corrosion coating to the aluminium condensers. An improved version of the aluminum condenser in the form of specialized aluminium alloy with a lesser propensity for corrosion is being used in certain new models. Also, it has started offering more models with the copper condenser in its premium series. So, if you are someone who would prefer to go for LG AC but live in a corrosive environment, i.e proximity to sea/ocean or chemical factories then better go for AC model coming with a copper condenser.